News flash: It’s hot. And humid. In fact, if you’re reading this from just about anywhere in the US of A right now, you’re probably wishing that I hadn’t reminded you. For that, I apologize. But this little heat/humidity wave brought along a confectionery conundrum for me. I love toffee. And ever since I bought Chocolates and Confections last winter I’ve been unable to find a store-bought version that matches up to homemade. (Now pralines, those are another story. I’ll have those shipped from New Orleans, because damn they know what they’re doing). When it’s 100 degrees with 75% humidity, making candy can be a little bit tricky. But why not rise to the challenge? You have only deliciousness to gain! Fortunately, I’ve done the testing for you and this method should, nay, will work. Just take your time and remember: Enjoy cooking. It’s supposed to be fun. Thoroughly butter a 9 x 13 in. pan. In a 2-3 qt. saucepan, melt the butter over medium heat and then add the sugar, water, salt, and vanilla. Turn the heat to medium high and bring to a boil, stirring constantly with a heat-resistant spatula. Insert a candy thermometer and continue cooking while stirring until the buttercrunch reaches 300 degrees and turns a light golden brown. Pour into the prepared pan and spread quickly to the edges with a palette knife or offset spatula. Let cool until firm. It won’t take long—maybe 30-45 minutes. Temper your chocolate. Don’t panic. It’s really easy as long as you take it slow. Place a bowl over a pot of simmering water and add 6 oz. of the dark chocolate. Stir often and allow it to melt completely, but do not exceed 120 degrees F. Remove the pot from the heat and add the remaining 2 oz. of chocolate. (This technique is called “seeding” and goes a long way in making the final, set chocolate shiny and non-greasy). Stir until melted, and then continue stirring until the chocolate cools to about 85-90 degrees F.
Wipe the top of the cooled toffee to remove any oil and then spread on the melted chocolate in an even layer with palette knife. Sprinkle on the chopped nuts and some kosher salt and allow to cool completely to room temperature. Break into pieces and store in an airtight container. Normally this can be stored at room temperature, but during the summer months I keep it in the refrigerator in a tin lined with parchment paper. 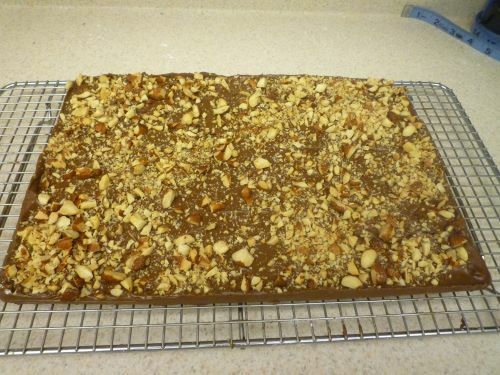 And no, you aren’t going crazy, the batch in this picture has toasted almonds on it. I didn’t get a pecan picture, sadly. This is sweet-and-salty at its most glorious. All good things are in this toffee. Add a chocolate layer on top if you like your sweets sweet. Honestly? I think it’s perfect just the way it is. In a wide pan, cook the bacon over medium heat, allowing the fat to render out slowly (this is important because you need it). When the bacon is crisp, remove it from the pan and drain on paper towels. Place the walnuts in the pan with the rendered bacon fat and stir to coat. Fry the walnuts until they are slightly golden and then set aside on paper towels to drain. Pat them dry once they have cooled completely, and then chop into small pieces. Remove and discard any large pieces of rubbery white fat that remain on the bacon and finely chop the meat. In a 2-3 qt. saucepan, melt the butter over medium heat and then add the sugar, maple sugar, water, salt, and vanilla. Turn the heat to medium high and bring to a boil, stirring constantly with a heat-resistant spatula. Insert a candy thermometer and continue cooking while stirring until the buttercrunch reaches 300 degrees and turns a light golden brown. Stir in the bacon pieces and walnuts and then pour into the prepared 9×13 pan. 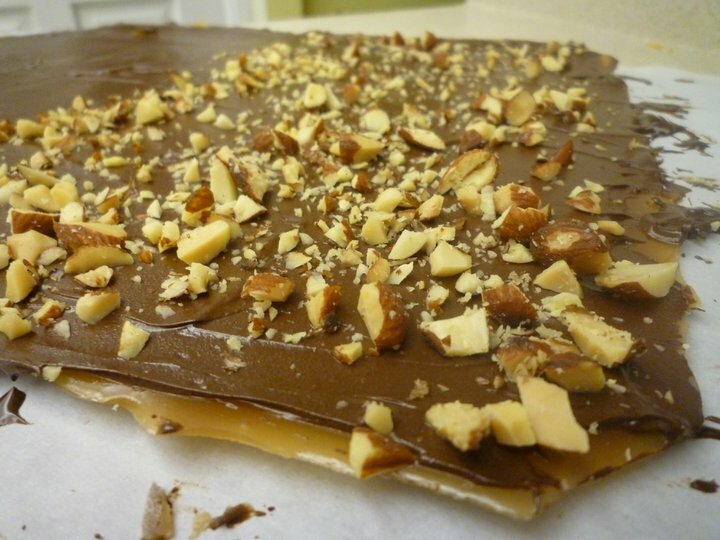 Quickly spread the buttercrunch into an even layer with a palette knife. Cool completely to room temperature and then break into pieces. Again, normally this can be stored at room temperature, but you may want to refrigerate it in an airtight tin if it is particularly humid in your kitchen. Well, that’s all she wrote for today, folks. Remember to share your candy, because half the fun of confectionery is making other people smile. ← Busy June, Happy News, and Brand New Recipes! This is just too cool! Sweet and salty at it’s best! Personally, I think the chocolate addition might just hit the spot for me! Chocolate and bacon; too intriguing for me not to try. Any suggestions for a good candy thermometer? I used to have one at my parents’ house, but after a few horrid tries at candy, I tossed it, along with all my candy-making ambitions. This CDN one is very accurate but can be a little bit slow to respond to temperature change. Generally I use a digital probe thermometer like this one. If you keep it calibrated and replace the battery regularly, it’s pretty reliable.